The new optical sensors iC-LTA and the iC-PT series supply incremental and commutation signals in the smallest possible design space. They are based on a flat optoQFN that is a mere 0.9 mm thick with a ultrathin glass lid. The optimized phased array structure of the photochips means that a minimal scanning area of just 1.9 mm x 3.1 mm is enough to generate 2,500 pulses from a code disc measuring only 26 mm across, for example. iC-PT sensors and measurement standards for diameters of 26 mm (iC-PT2613) and 33 mm (iC-PT33xx) are available. iC-LTA is a functionally compatible yet unstructured photo array for specific customized design. 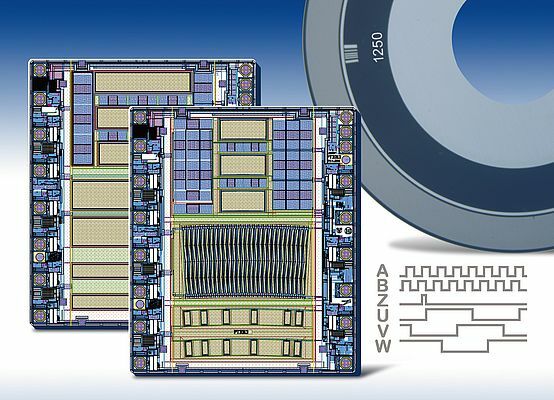 The Hall sensors used for motor commutation to date have been replaced by three separate on-chip scanning tracks. Here, the code disc stipulates the required signal and can be easily designed to suit the required motor pole count. The photocurrent signals are conditioned by low-noise CMOS amplifiers and can either be comparated or interpolated twice and output through 4 mA push/pull drivers as indexed encoder quadrature signals. Output frequencies of up to 800 kHz are permitted, enabling motors with speeds of up to 20,000 rpm to be controlled (at 2,500 pulses). Analog test signals can be activated for assembly and alignment. The small sampling area and a high sensitivity help to reduce the amount of power needed for the obligatory LED; a few milliamps of operating current are sufficient. This improves the expected lifetime of the LED, especially if the motor has high operating temperatures. Devices iC-LTA and iC-PT control the LED themselves and also compensate for fluctuations in the operating temperature range of -40°C to +120°C. Using the latest encoder LEDs, such as iC-TL85 or iC-SD85, for example, the system current consumption is ca. 12 mA. A supply voltage starting at just 3.5 V is enough and enables an external polarity protection circuit and voltage regulator to be added if required when the device is operated on 5 V.